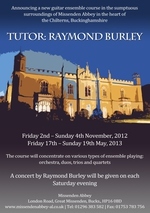 2nd - 4th Nov 2012 saw the first of the guitar courses operating at Missenden Abbey in Buckinghamshire. 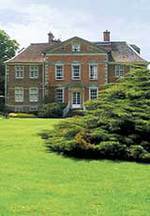 Having run courses at Urchfont Manor near Devizes, Wiltshire for many years I was just a little apprehensive about the change of venue. Thankfully everything worked out very well. The first noticeable thing was that we were given a much larger space in which to function. The three large ensemble pieces were a published version of Mendelsohn’s Song Without Words op.19. no.6, plus my arrangements of the Concerto Grosso op.6, no.1 (in five movements) by Handel and Marvin Hamlisch’s Nobody Does it Better from the James Bond film The Spy Who Loved Me. Never let it be said we don’t offer variety. The Saturday evening concert was given by flautist Chris Britton and me featuring music by Bach - a selection of pieces from our forthcoming CD. The Sunday morning Student Concert included the three large ensembles plus works performed by several smaller ensembles. As always I would like to thank all the participants at this year’s course for their talents and enthusiasm. It would be lovely to see some, or all, of them again at future events; also, of course, the staff at Missenden for helping the weekend to run smoothly. The next weekend course at Missenden Abbey will be 17th - 19th May 2013. There will also be a summer course there between the dates of 12th - 14th August 2013 and another on 7th - 9th February 2014.